Looking for a large rental space to host an event? 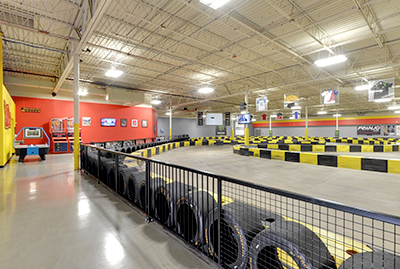 At Pole Position Raceway in St. Louis, our state-of-the art facility includes over 56,000 square feet of space equipped to host events while simultaneously offering a unique racing experience for your guests. By renting out our facility, you have the freedom to choose what type of racing event you would like to host, with options ranging from open racing, elimination racing, Ironman races, team endurance races, and more. We can customize your racing experience to your desire and needs. With our capacity to host up to 200 people, a full facility rental in St. Louis is ideal for large groups. When looking to host an event at Pole Position Raceway, our facility will be closed to the public for the full rental time, allowing for exclusive, uninterrupted use of our race track and meeting room. Should you wish to discuss catering or upgrade options contact one of our event coordinators at 314-925-7545. We can provide you with additional details and walk you through the planning process. We do require a reservation prior to the event so feel free to review our Calendar of Events to see open dates for a facility rental in St. Louis and give us a call! A full facility rental allows for complete exclusivity of our race track and is sure to be a unique experience your friends and family will cherish for years to come. Request a Reservation today.